At Dyslexia and Learning Solutions Ontario, children and adults with Dyslexia are always treated with the utmost respect and dignity they deserve. For the Davis Program to be effective, a person must be personally motivated and willing to improve some aspect of learning or school performance. The Davis Dyslexia Correction program is a DRUG FREE solution. Therefore, before a program can be scheduled, clients must disclose all medications. If you have any questions about these requirements, please contact us. Five consecutive days of one-to-one facilitation (ages 8 and up). Support training for client's family, tutor(s) or teacher(s) on the afternoon of the last day to ensure post-program follow-up and success. Davis Orientation Counseling™, as outlined in The Gift of Dyslexia by Ronald D. Davis, provides clients with the ability to detect and self-correct distorted perception caused by confusion with letters, words, numerals, and other symbols. 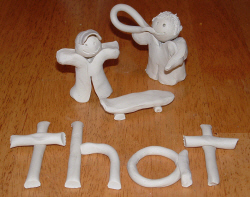 Working with clay allows for confusion to be realized and resolved - in a multi-dimensional, creative way that fits the dyslexic thinking and learning style. Clients start by resolving confusion with the basic literacy symbols, including letters (above) and punctuation marks. Clients then work with clay to master words that do not give them a picture. We call these "trigger words" and there are 219 words identified by Davis that need to be mastered. Most of these will be done following the one-week program. This inspiring film was produced by The Learning People, a network of Licensed Davis® Dyslexia Correction Facilitators in the UK (used with permission).